There was a time when the traditional television format was a great and lonesome ruler. Those glory days are long gone now, with consumers shifting away from this format by taking measures into their own hands. They are switching over in great bunches to streaming content they want to consume when they want to consume it. And this evolution is taking its toll on companies. How did streaming become so popular in a relatively small time span, you might ask? One of the crucial aspects for a successful trend is that it has to react to certain problems that consumers are dealing with. Streaming deals with the fact that consumers feel the need to personalize the content they want to consume. It also creates a feeling of exclusiveness and eliminates patience. These three aspects were not present in traditional formatted television. Streaming provides consumers with content which they are interested in, whenever and wherever they want it. Viewing habits have changed drastically in the last few years. To sum it up in one sentence: more people consume more content on several devices in the easiest and fastest way possible. The younger the audience, the more devices they use to consume content. Besides that, content nowadays is completely integrated in our daily lives and especially in our social media. As the years pass by, this will only increase even more. For example, Tesla cars have access to streaming content and when self-driving cars will occupy the roads, they will then be a platform which we can consume content on. Today we can clearly distinguish two types of content being created. One is created by individuals and the other is created by professional providers of on-demand Internet streaming media. The first group of content creators has been gaining in popularity rapidly, both online and offline. They have become the new influencers of society. For example, let’s take a look at YouTube and Twitch.tv (live streaming platform) which I, as a gamer, often use. The level of growth these platforms have known the last years is staggering. Why are they so popular? As stated before, they play into the errors of traditional content. How can you create more personalized content then if your community chooses what you should create? Furthermore, Twitch is all about live streaming, meaning that when you’re not there to see it live, you won’t see it at all. Can it get any more exclusive than that? In the near future these content creators will function very much in the same way as important bloggers function today. They can be sponsored by brands which are related to the content they create, in order to maintain authenticity. The sponsoring should always enhance the content creation and therefore show the audience the immediate impact of a certain product. Events are also being streamed, like eSports competitions, meaning that physical sponsoring at events suddenly reaches a larger audience than only those physically present. These platforms for individual content creators are gaining popularity very rapidly. Apps like Periscope or Ustream have transposed the trend from the gaming industry to the more mainstream market and will be doing so in years to come. While only reaching a selective audience, it shows great potential for businesses. Many people are talking about it and use it, so marketers can no longer ignore the service they could provide. The content that is being streamed is about all kinds of subjects such as concerts, comedy shows, games and so on. We can categorize them into the recreational segment. It’s not business-related yet, however there is a big potential for marketers. 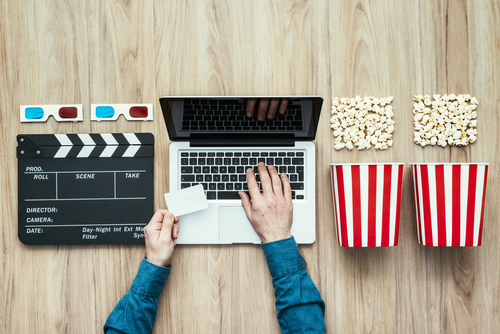 It has never been so easy for marketers to create and distribute their own content, thanks to the integration of social media in streaming platforms. They could use live streaming for several purposes such as customer service, product demos, brand awareness and entertainment. A specific example of interesting content by streaming could be an interview with an important stakeholder of the company while interacting with consumers, or showing some behind-the-scenes of the company. It’s a great way to let consumers get to know your company and try to get them to engage with your brand. Live video streaming gives you the excitement of sharing your world with an audience that can comment in real time. Streaming of content will be more transparent and will add a human touch to your company. Besides companies sharing their own content and creating a strong emotional brand relationship, they can also learn about consumers. What better way to stay on top of trends with consumers than watching what they’re doing? What companies can see in these short-format consumer-created videos will tell them more than 100 blogs ever would. Again I refer to the gaming industry due to it being ahead of its time. They release beta versions of their games to streamers for two reasons: one is to create a hype/buzz around the game; but the other reason is much more important: they get to see how their consumers interact with the game and can observe not only the interactions but also the emotional aspect with those playing their game. The other type of content being created is that of professional providers of on-demand Internet streaming media. Companies in this category are Netflix and HBO. They create a stand-alone service and have no need for a cable. These parties have played a major role in changing the content landscape. The consumer has experienced the future of content, in which the distribution and consumption will be completely different. This type of content creation plays into the same aspects as the previous, but is adding another important solution to consumer behavior. Impatience is being eliminated. Consumers can watch everything they want when they want it, without having to consider the traditional television schedules. In the years to come, traditional television will continue to lose in popularity due to the format which no longer appeals to the consumers’ behavior. If there’s one group within the population which is driving the disruptive trend, it has to be the Millennials. Their primary means of consuming content are mobile devices, online and streaming. Younger audiences in particular consume content on other platforms than on television. They expect to have the easiest access to content wherever and whenever they want. And that’s exactly what players like HBO and Netflix offer, by responding to changes in the environment of consumers and their consuming patterns. They have created new models and managed to cut the cord for content with their à la carte purchasing. HBO and Netflix, but also individual content creators, have to keep in mind that the consumer trend has also impacted the production trend. The content delivered via streaming requires a change when it comes to how the creators select and create projects. Two consumer trends stand out nowadays with regards to how consumers consume their content. The first and most prominent trend is a phenomenon called Binge watching, which has a major impact on the traditional television format. Binge watching means that people watch content for longer time spans than usual. In practice this means that people watch several episodes of a series or several films in one single marathon, where they completely devaluate the entire television program schedule. This consumer behavior plays into the fact that they are impatient and want to see as much as possible as fast as possible. Producers have reacted to this by creating long-format drama series such as Game of Thrones and House of Cards, which are very popular amongst binge-watchers. But the content nowadays has to have a faster pace in order to reinforce the viewers’ interest over a longer time span. Producers want to keep action, interest and pace at a high level in order to reduce the risk that consumers skip through slower parts. Another phenomenon we see among consumers is watching content in short bursts. This phenomenon is called short form videos. Content has to be broken up into smaller segments that can be watched, paused and then continued several hours later, meaning that the small fragments themselves are more important than the entire content package. The music industry has experienced this when iTunes made its entrance into the market. A lot of Apple consumers do not buy entire albums but pick and purchase only the songs they like. I’m a huge YouTube fan and I’m subscribed to several content producers. One of them is Good Mythical Morning, a very popular daily morning talk show. They’ve accumulated an astonishing 8.5 million subscribers and you know how? Two guys, one subject and 10 minutes of your time. The reason for their success is that you can consume it very rapidly on whichever device you want, whenever you want. Besides that, you don’t have to worry about missing episodes because they are not linked to each other. They know that people watch content when they have to wait for a train and are looking for a small burst of fun. Deloitte UK did a survey in 2015 and stated that 90% of males and 78% of females aged 16 to 24 consume at least one of these short form videos a day. I’ve already stated that the gaming industry is ahead of its time in the online streaming content segment. Gamers on YouTube are very successful because of the fact that they often create series. They film them playing a game for 100 minutes and then break it up into a 10 short form videos of 10-minute gameplay. This is a format that is loved by the viewers. One thing hasn’t changed as for content, not even after the massive disruptive consumer trend. Content can only survive if it is profitable. The most profitable content today is still traditional television, even if it’s under threat from new forms of content creation. Those trends which feed the viewers’ trend but don’t create any revenue won’t survive. Advertising whilst viewing content is being disrupted whereas streaming allows users to skip the commercials. In the advertisers’ world, a paradox is unfolding before them. On the one hand the new way of providing content brings the producer closer to the consumer, allowing him to gather more data, making it easier to target the viewer based on particular demographics, platform and time. For example, Spotify splits its customers into several segments based on mood or activity. This allows companies to target very specific audiences with very specific ads. Someone who’s listening to work-out music could be targeted for sportswear. But on the other hand providers have to meet consumers’ demands and a lot of viewers are attempting to bypass the advertising. Brands have to become more relevant and creative in order to catch the attention of viewers. The current situation of media is being disrupted as we speak and this trend will keep going and continue to change the customers’ behavior and expectations. But if we combine the new streaming culture with tomorrow’s technologies, the possibilities are endless. Consuming content on Oculus Rift (virtual reality head-mounted display) will again disrupt the trend in perhaps another direction. The entire creation and distribution of content will see many changes but it is up to marketers to find ways to apply marketing to this evolution. The efforts that marketers must make in order to survive the trends might only be favorable for a very short time. Nonetheless these actions can create great results and with Generation Z banging on the door, marketers have to evolve with their market in order to create continuity.